No one is baffled anymore by the quantity of spam emails sent over the Internet because, unfortunately, hundreds of unwanted messages reach our Inbox regularly (especially if the email address is publicly available, on a blog for example). Because of this, all manner of scams and hoaxes have been invented, every new iteration being more cunning than before. I believe that most of us have built up a natural resistance to clicking strange links and so on, but even with a keen eye you can still be duped, so here are a couple of quick steps to take for a safer email experience. This is really easy to do, and the best part is that it’s fully automated – so you’re protected (to some degree) for as long as you leave it on! 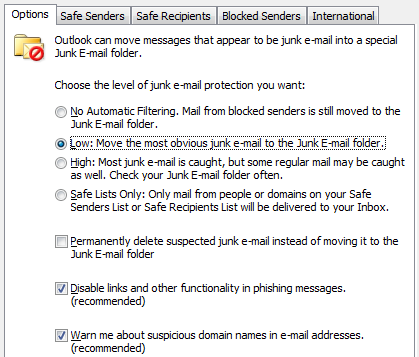 In Outlook 2010, just go to your Home tab then click on Junk -> Junk Options (in the Delete section) and choose between the different options. I suggest testing between the Low and High levels, which will offer you a decent protection against unwanted scam or hoax emails, and keeping the other settings as they are displayed above. If you’ve got access to the company email address list, then it’s a good idea to add it to the Safe Senders and Recipients list. This will ensure that emails from your co-workers will not be regarded as hoaxes or scams, and you can always add to the list by right-clicking an email -> Junk -> Never block sender. Tip: if you’d like to extract safe addresses from a particular folder in Outlook, then look no further than Email Address Collector – you can filter and save a list of safe senders in just a few clicks! If you’re receiving your emails through a dedicated server, then it’s always a good idea to install a well-known anti-spam program on it. We here use SpamAssassin which works great at filtering out scam emails. Just make sure to create a rule in Outlook that deals with the emails flagged by your program as “spam” (for SpamAssassin, I have a rule that moves all emails with “X-Spam-Flag: YES” in their header to the Spam folder). 4. If you’re not sure if the email is a scam or hoax, always check the email header! So, you’ve won the Spanish Lottery, right? You look at the email address and it is from the official website, so it’s not a scam, right? Well, one of the first things to do with emails that you aren’t really sure are hoaxes is to check the email header. Scammers can hide the origin of the message when viewed directly in Outlook, but if you open an email -> go to File -> Info -> Properties you can see the real info. In the newly opened window, just check and make sure that the email originated from a certain website and that it’s not just some hoax. As I said above, in time, each of us develops a sort-of resistance to stuff like this… If it’s too good to be true, then it’s probably a scam! If you haven’t played in the Spanish Lottery, then it’s a hoax… the list goes on. Even so, not all scam emails are as clear as daylight – you may have an account with Bank of America and you may have recently had some issues with it, but that doesn’t mean that the message isn’t a hoax based on a lucky coincidence (that’s why you receive the same email scam over and over – sometimes, it just arrives at the perfect time for some). you should never click on links from unknown or dubious senders. All of the above are email scams of course, and you should delete the messages as soon as possible. Clicking on links, downloading or opening attachments can compromise your privacy (and maybe even bank account), so take care! For an added level of security, Outlook automatically disables links in the messages it considers as spam, so you’re pretty safe from hoaxes while those emails are in that folder. Unfortunately, as we all know, many will still wind up in your Inbox, with their links and attachments intact. And what happens in cases where someone else is using your computer, someone not as well versed in these things as yourself? For your peace of mind, one of our best-selling add-ins, Bells&Whistles for Outlook, comes with a pre-defined list of attachments that it will block… and when we say block, we mean it! While Outlook just pops up a warning (which can be permanently turned off) when opening dubious attachments, Bells&Whistles will only display its name – and that’s all! The attachment can’t be downloaded, ran or anything else, no matter the folder it resides in! So, you can leave home and not worry that grandpa fell for on email scam and your hard-earned dollars are used to buying who-knows-what. You can define the types of attachments Bells&Whistles will block by their extension – the predefined list comes with all of the most used extensions used in email hoaxes, so you’re protected right away! 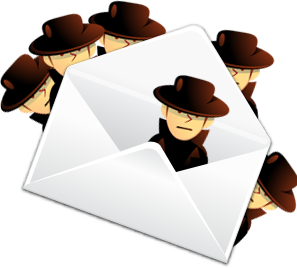 Additionally, we have included the extensions for files that are known for spreading viruses, so you’ll be safe from email scams and malware as well! If you want to give Bells&Whistles a try, then just download the latest version from here and take it for a spin (all features are working, so you get to test it out to the fullest), or go ahead and buy a full license for only $29.95 here (30 day money back guarantee, so no scam here 🙂 ). If you have any tales about email scams, if you’ve been the victim of a hoax or just want to say hi, then you can contact us either at support@emailaddressmanager.com or in the comment section below. One simple solution would be, not to trust everything that shows up in inbox. << What is the best time to send email newsletters?